The Daybreak competition was one of the most popular TV competitions in the UK (often referred to as “Lorraine competition” because the contest spans both TV shows). There were massive cash prizes, holidays, cars and gadgets to be won nearly every week. Daybreak replaced GMTV and has since been replaced itself by Good Morning Britain. Entry is via phone cost around £1.50, however entry online was free. Sometimes finding ITV.com competitions can be difficult & sometimes you even miss hearing the competition question…so we listed them here so they were easy for you to find. As you know, Daybreak is no longer with us however we are leaving this page in place. View more info on the Good Morning Britain competition. The problem is that you have to be watching Daybreak when the question is announced…because if you miss it, you cannot enter as you do not know the question. Even if you do catch the question, itv competitions can be difficult to find on the itv.com site. 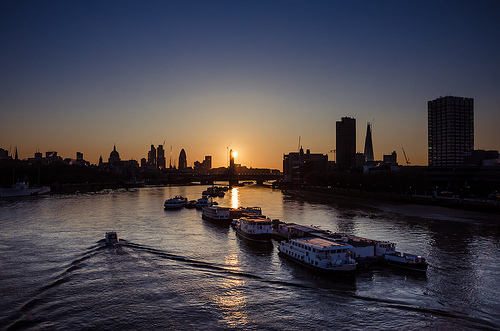 Simply visit the Daybreak links for questions, answers & a link to the competition entry page! Yes! We make it really easy for you enter itv competitions by listing them all here! If you don’t know the Daybreak competition works, you may wonder why we post the question and answers to such obvious questions. The reason is that you need to watch Daybreak or Lorraine to get the competition question. Then you phone, text or go online to submit your answer and enter the contest. 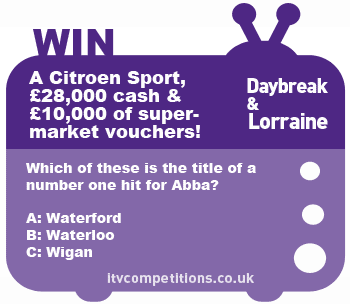 If you go online you will notice that all itv.com competitions only have space for you to submit your answer; A, B or C – there is no question; you need to watch the shows. Since it is easy to miss the show or question, we provide you with them here. We also make it easy for you to find the correct page and submit your entry – this saves you the cost of entering via phone or text (around £1.50) & stress of finding the correct competition page. The Daybreak show runs early morning on weekdays ITV (aka Channel 3) from 6am to 8:30am and the competition is announced a few times during that period. If you miss it, you can always catch Lorraine (the competition is the same across both shows) which runs until 9:25. They are good TV shows & worth popping on in the morning, but don’t fret if you miss the competition question – we’ll have it here for you!When Do I need To Watch The TV Show? The prizes are always big and are generally anywhere in the region of £30,000 – £60,000 worth of prizes. It could be straight-up hard cash (always tax-free) or sponsored prizes such as luxury holidays and cars. Sometimes you can even win the re-payment of your mortgage! Trust me…they’re always awesome; itv.com provide the best UK competitions without question! How Many Times Can I Enter Daybreak Competitions? Not everyone knows this, but you can enter most itv.com competitions more than once. We recommend you always check the terms and conditions incase you invalidate your entry, but at this time you can enter up to 6 times with one telephone number. Please always remember to check the terms and conditions; these can change any time & for any individual itv competition; terms & conditions. There are many competition publisher who are a little dishonest in their publications, however those operated by the ITV broadcasting company can be trusted 100%. They are competition veterans and winners are often featured throughout the show – sometimes the winners announce the competition questions! You can view a list of Daybreak competition winners here.